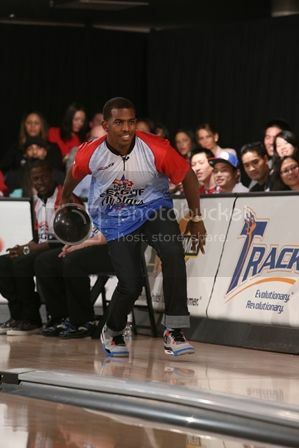 LOS ANGELES, CA - On January 7th, LA Clippers star point guard and five-time NBA All-Star Chris Paul hosted the Fifth Annual Chris Paul PBA All-Stars Invitational to benefit his CP3 Foundation. Established in 2005, the foundation provides funding for activities ranging from a scholarship program to food drives to recreational support programs for children in under served communities. Celebrities and PBA Tour stars joined Paul for the event at Lucky Strike LA Live to compete in doubles elimination competition. Participants included actors Jesse Williams, Kevin Hart and Quinton Aaron, athletes Blake Griffin, LaMarr Woodley, Terrell Owens, Jalen Rose, and Chris Hardwick, along with PBA stars Norm Duke, Chris Barnes, Missy Parkin and more. The All-Stars Invitational began five years ago in Paul’s native Winston-Salem, N.C. This marked the second year it was held in Los Angeles, with the previous two events held in New Orleans. ESPN will air the event on Super Bowl Sunday (Feb. 3) at 4 p.m. EST just prior to the Super Bowl telecast. In 2005, Paul established the CP3 Foundation in honor of his late grandfather to provide scholarships for youth to attend Wake Forest University. The foundation strives to impact the communities it serves by using its resources and passion for philanthropy to enhance and promote education, health, sports and social responsibility for youth and families. Paul's emphasis on community involvement has won the CP3 Foundation the NBA's Community Assist Award three times. The foundation's initiatives include partnerships with Feed The Children, Make-A-Wish Foundation, Boys & Girls Club, Habitat for Humanity and LA’s Best. The foundation also sponsors and supports literacy initiatives, youth basketball clinics and court refurbishments. In 2010 Chris partnered with Chase Bank to launch the CP3 Afterschool Zone in New Orleans, to provide an enriching afterschool environment for youth. To learn more about the CP3 Foundation, visit www.cp3foundation.org.